Star Polyps come in different colors. These above are brownish, with green centers. They are quick growers, and I strongly recommend you place them on an island where they can't spread throughout the tank. They are enjoyable to view, as long as they don't become invasive. This is an easy to keep beginner's coral. Henry states: Blue snowflake polyps make a great addition to anyone’s tank! They are easy to take of and their vivid blue color makes them absolutely stunning. They are part of the Clavulariidae family, but are smaller than other clavularia species. Generally their polyps are no larger than ¼” but their beautiful color makes up for their small size! They are generally placed lower in the tank for best coloration but I have noticed they can tolerate higher light locations. They do not require direct feeding, but will benefit from foods that are for filter feeders. Pulsing Xenia is my favorite soft coral. Everyone loves to watch the individual polyps open and close independently of each other. Although they can spread to weed-like proportions, I have come to rely on them for indications of the tank's condition. If all is well, they look happy, and conversely when they look droopy or mangled, something is out of whack. They are truly my 'Tank Barometer.' Since they grow upward toward light, placing them up high will control their spreading. Button Polyps make a nice addition to your reef, and there are different kinds. These are Palythoa, which are recognized by the solid mat that these individual polyp heads extend from. When touched, they slime like crazy, so avoid disturbing them if possible. Palythoa Toxin is considered dangerous to human touch; wash your hands after handling. I've had no problems personally, and shared numerous frags of this coral in the past. Read more about Palythoa sp. Nepthea coral adds some motion to the aquarium, and the tiny polyps display delicate properties too. This coral looks its absolute best under actinics only. It is an easy to share coral, one you can frag with the cut of a razor blade. Once trimmed off the parent, secure the frag to a small rock or frag plug using fishing line or a gentle rubber band. Given enough time, the coral will grow onto the rock and once secure will stay put. Green Star Polyps grow well in strong to moderate lighting and good flow. The mat (or base) is typically purple. At night, the polyps recede into the mat, and only bumps are visible. Some consider these to be a weed, but if kept on some rock away from other rockwork, its spreading can be controlled. If you get a frag, figure out which side is the underside so you don't glue it down on the polyped side. Devil's Hand grows easily in good water conditions. It has more than doubled in size in a few months, and continued to garner attention with its delicate yellow polyps. These will receed inside the coral and the main body will shrink somewhat for a couple of days, as if to prepare for the next growth spurt. VHO lighting suffices, and avoid contact with other neighboring corals that might sting it. Under metal halides, it grew to the size of a baseball glove, and dropped frags on a weekly basis. I gave away frags to people all the time, just to control the excess. My first soft coral was the Colt. The LFS assured me it was a great beginner coral, and I promptly propped it in the center section of my display and enjoyed how it waved to and fro with the current. As soon as I walked away, my brand new coral was sucked into the intake of a nearby pump! It fully recovered, and it grew daily. A large piece attached itself to a neighboring rock, which was transferred to my other tank with equal success. VHO or PCs seem perfect. 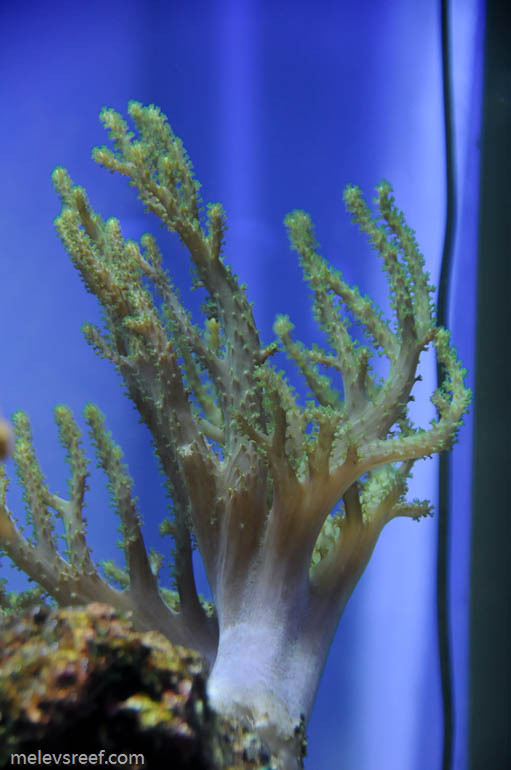 Anthellia is soft coral that looks somewhat similar to Xenia, except it doesn't pulse. Polyps extend from a mat during the lighted-period, and withdraw into themselves during the night like inverted tube socks. I'm not a fan of this easy-to-keep coral, because it tends to grow very fast and spread onto neighboring corals so quickly that those become smothered. It can be manually removed from the rockwork, but attention to detail is important if you want to avoid its return. It is a filter-feeder and requires normal reef-tank parameters with quality lighting. Read more about Anthellia sp. The nice thing about leather corals is you can cut them with a razor blade or sharp knife, mount them to a small rock with a rubberband, and in a few weeks have a nice little coral growing in your reef. Above is a Toadstool Leather frag that I brought home from MACNA XV. Note the little polyps extended from the tubes, indicating good health. Here is an image 2 years later. Posted 4 hours 26 min ago.